The developer publisher of outdoor sporting games has teamed with the fishing brand to focus on the participation sport in North America - the result is THE BEST FISHING GAME EVER! 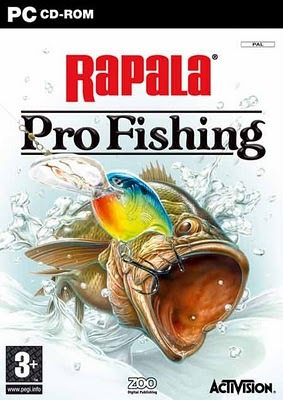 Rapala Pro Fishing offers not only the leading name in fishing, but the most realistic underwater environments, beautifully detailed fish, and the best rod control of any fishing game on the market for an unbeatable fishing experience. Even its live-action situational tips will improve the avid angler on the real water! * 11 species of highly detailed fish with realistic AI. * 2 gameplay modes: Freedom Fishing and Tournament. * Freedom Fishing mode lets you fish anywhere. * 20 unique tournaments to enter in Tournament mode for realistic trophy fish action. * Tournaments include bonus trophy fish and unlockable Amazon levels. * Over 750 authentic Rapala lures. * Technology upgrades over previously released fishing titles. * Player actually controls the rod for increased realism. * Depth of field, caustic effects, light rays, vegetation modeled from real life will provide the best underwater environments ever. * Internet high scores posting. * 12 unique maps in realistic geographical locations all over the world. Pentium III 866MHz Windows PC or higher with 256MB RAM Windows ME, 2000 or XP operating system 64MB DirectX 9 compatible 3D video card DirectX 9 compatible sound card 8X or faster CD-ROM drive 750MB of free Hard Drive Space Cable/DSL connection for Internet play. Anda sedang membaca artikel tentang Download Rapala Pro Fishing dan anda bisa menemukan artikel Download Rapala Pro Fishing ini dengan url http://team-cyberart.blogspot.com/2012/05/download-rapala-pro-fishing.html,anda boleh menyebar luaskannya atau mengcopy paste-nya jika artikel Download Rapala Pro Fishing ini sangat bermanfaat bagi teman-teman anda,namun jangan lupa untuk meletakkan link Download Rapala Pro Fishing sumbernya.